Kyle Farnsworth appears unlikely to remain with the Mets beyond the next few days. JUPITER, Fla. -- The Mets hoped to find values with the signings of Jose Valverde and Kyle Farnsworth on minor-league deals. Now, only Valverde appears slated to make it to Opening Day. Farnsworth, 37, has a contract out on Sunday and is not projected to make the roster. Even if Farnsworth did not exercise his option to depart, it appears unlikely the Mets would offer him a $100,000 retention bonus. That payment would be required to be paid five days before the season to get Farnsworth to go to the minors. Farnsworth's velocity has steadily decreased in recent years. It averaged 96.0 mph in 2009, 94.9 in 2010, 94.7 in 2011, 93.2 in 2012 and 92.6 last year, and looks down even more now. One scout in attendance at Saturday's game suggested it seems as if Farnsworth has almost become a changeup-dominant pitcher this spring training. 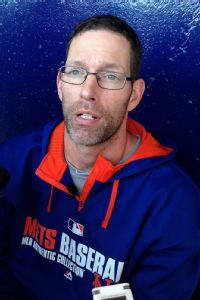 The bottom line: Farnsworth has appeared in the majors for 15 seasons, but it may be a struggle to latch on anywhere to open the year, at least at the major league level. The Mets' bullpen is likely to include Bobby Parnell, Vic Black, Valverde, Carlos Torres, Jeurys Familia, Scott Rice and John Lannan.